Guyana’s Badminton player Narayan Ramdhani arrived in Gold Coast Australia on Monday for the Commonwealth Games 2018. 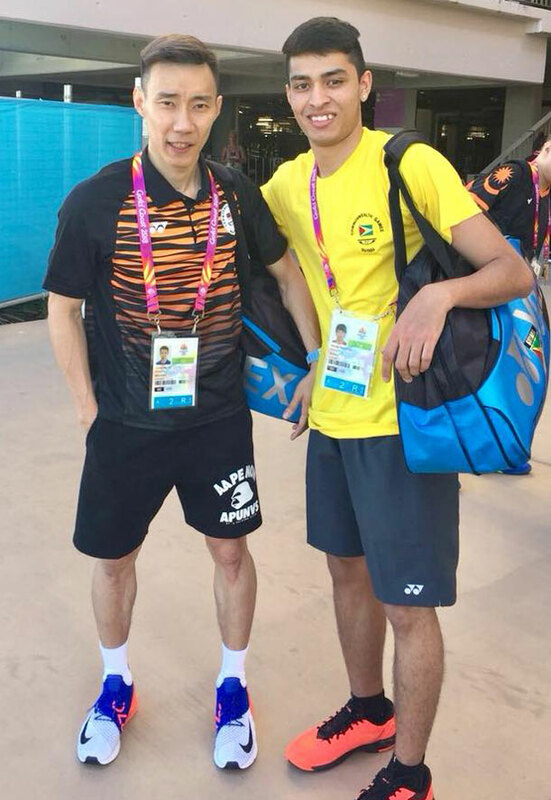 Narayan Ramdhani with Badminton Legend and world’s top player Lee Chong Wei of Malaysia who has won 691 Championships to date. He participated in the Flag Raising ceremony yesterday with the rest of the Guyana Teams and also started his first training sessions at the Main Hall, Carrara Sports and Leisure Centre getting in shape for his upcoming action on April 10th in the Men’s Singles Round of 64 Event. Narayan is up against Vernon Sameed of St. Helena in the first round. Leading up to this match he will be in constant training daily to get his game plan to the best possible way. Tomorrow he will also take part in the Opening Ceremony of the CG 2018.